Shihab Shamma received his B.S. degree in 1976 from Imperial College, in London, U.K. He received his M.S. and Ph.D. degrees in Electrical Engineering from Stanford University in 1977 and 1980, respectively. Dr. Shamma received his M.A. in Slavic Languages and Literature in 1980 from the same institution. Dr. Shamma has been a member of the University of Maryland faculty since 1984 when he started as an Assistant Professor in the Electrical Engineering Department. He became an Associate Professor in 1989. He has been associated with the Systems Research Center since its inception in 1985, and received a joint appointment in 1990. Dr. Shamma also holds a joint appointment with the University of Maryland Institute for Advanced Computer Studies. He is a fellow of the Acoustical Society of America. 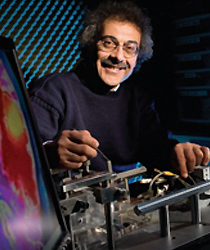 Dr. Shamma's research deals with issues in computational neuroscience, euromorphic engineering, and the development of microsensor systems for experimental research and neural prostheses. Primary focus has been on studying the computational principles underlying the processing and recognition of complex sounds (speech and music) in the auditory system, and the relationship between auditory and visual processing. Signal processing algorithms inspired by data from neurophysiological and psychoacoustical experiments are being developed and applied in a variety of systems such as speech and voice recognition and diagnostics in industrial manufacturing. Other research interests included (at various times) the development of photolithographic microelectrode arrays for recording and stimulation of neural signals, a VLSI implementations of auditory processing algorithms, and development of robotic systems for the detection and tracking of multiple sound sources. Study reveals how the brain nimbly and rapidly change responses to incoming sensory stimuli depending upon the cognitive context of the moment. The network will advance understanding of how biological systems learn complex symbolic signals, and create artificial systems with similar capabilities. Shamma was selected for his work applying signal processing to auditory neuroscience. Multidisciplinary research will examine strategies to improve communication challenges. Research team to examine effect of bioelectric stimulation on second language learning, brain plasticity. The University of Maryland will receive up to $8.58 million from DARPA for the research, which is led by the UMD Center for Advanced Study of Language. Alumna Mounya Elhilali also was a presenter.